Diners who flocked to the opening of modern Chinese restaurant – Hakkasan – at the opulent Emirates Palace in Abu Dhabi were ushered into a magical world where haute Chinois culture and cuisine effortlessly blends with Arabian mystique. Backed by the famed Michelin stars from Michelin Guides, the global authority on restaurant and hotel evaluations, Hakkasan brings the grandeur of Chinese fine dining right at the heart of the capital. Hakkasan Abu Dhabi’s expansive 16,000 square feet of space includes a dining area, a bar, a lounge and four private dining rooms. All sections are separated by carved wooden lattice screens made of American red oak, adding luster to the luxurious interior of the high-class restaurant. Alan Yau, the man behind the Hakkasan concept of offering modern Chinese dishes with chic Chinese décor, aimed to reproduce the same ambience of the restaurant’s London branch in the UAE and complement it with Arabian touches. To achieve this, he contracted the services of long-time design partner Gilles and Boissier. 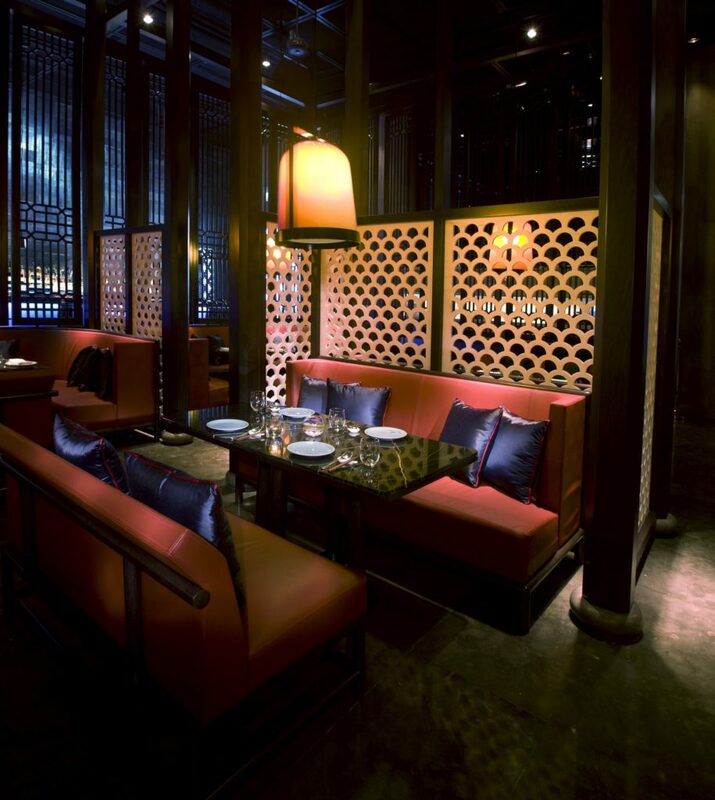 The Paris-based design firm maintained trademark modern-ethnic Hakkasan elements and accentuated the facility with embroidered finished furniture and marbled Chinese forms to add body to key spaces. The main dining area was crafted into a wooden cage-like structure surrounded by blue glass nested in a stainless steel frame. Woods Bagot, a global design studio specialising in the design and planning of facilities, was also brought onboard as the Executive Architect for Hakkasan Abu Dhabi. The leading firm managed key functions including the liaison work between project consultants and the client in addition to handling approvals on material selections. Woods Bagot also had an influence on the design in the ‘Front of House’ areas, but more importantly as and when required during resolution of design issues. In addition, the firm designed the entire ‘Back of House’ area excluding the kitchen. The design of the restaurant pays tribute to the emotional aspects of the venue, considering important factors such as the aura of each space, the emotion it provokes and nurtures, and the logistics behind its aesthetics, functions and form. Further, Hakkasan Abu Dhabi’s unique feel is achieved by employing the Chinese art of Feng Shui and tuning the layout and design in harmony with the social dynamics within the space, all of which involved careful consideration of how people would interact in the designed environment. 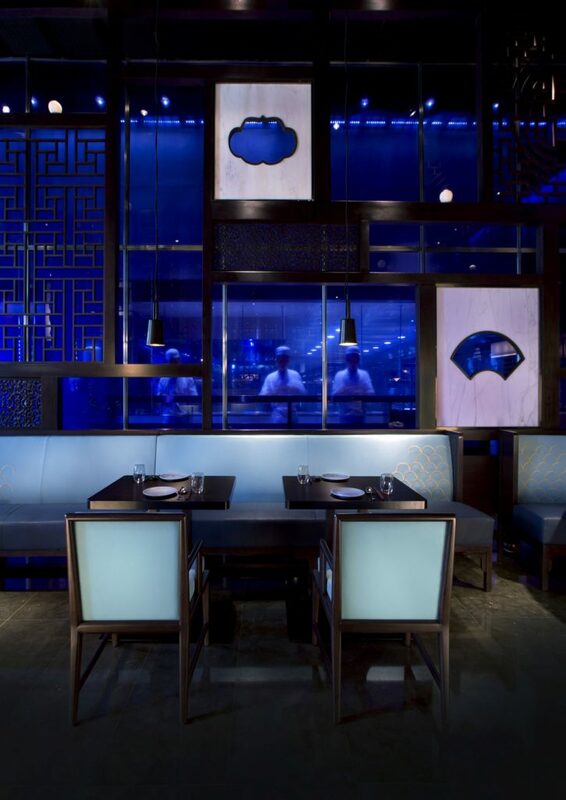 The design ethos for Hakkasan was based on the theme ‘Bringing back the Dragon’ in honor of the colorful cultural roots of Chinese restaurants from days of yore. 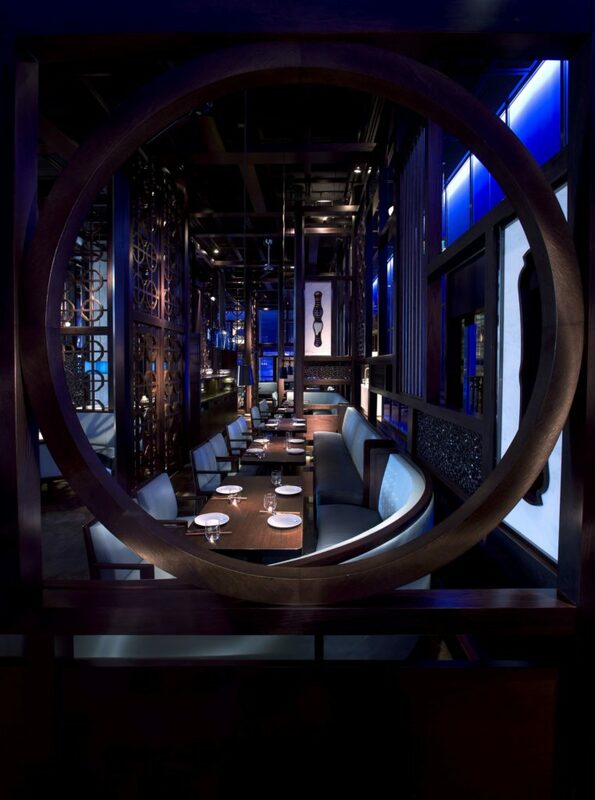 Woods Bagot sought to imbibe a distinctive Chinese feel coupled with rich, sensuous overtones with the use of American red oak across different parts of Hakkasan. Space planning was also a major consideration in designing the layout. The methods and elements employed focused on the spatial relationship of the furniture; the size and dimensions of the tables and chairs; scene setting of lighting; music and sound; fire; and scent. The end result is a comfortable setting that dispenses with the hows and whys and says ‘it just is’. “To implement the design by Gilles & Boissier, which intended to impart a strong Oriental feel to the place for the patrons, Woods Bagot and the contractor, Decovision, adopted the use of red oak along the various parts of the restaurant. If you look around, you will find that the internal columns, screens, ceilings, some of the walls and the loose furniture are made of red oak. 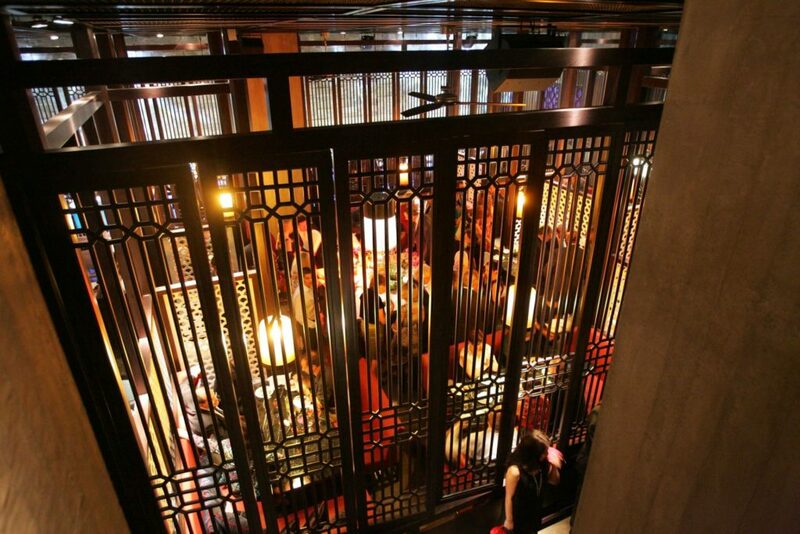 The wood magnifies the Chinois ambience while giving off a relaxing vibe,” said Bruno Veninga, Associate, Woods Bagot. Hakkasan Abu Dhabi integrates design cues from the original Hakkasan restaurant in London and the collaboration between Woods Bagot and Giles & Boissier has ultimately resulted in achieving the signature aesthetic feel that has now become embedded as a fundamental principle of the Hakkasan concept. The style exudes a cool charm that bestows calm, tranquillity and modesty to a luxurious and modern environment. 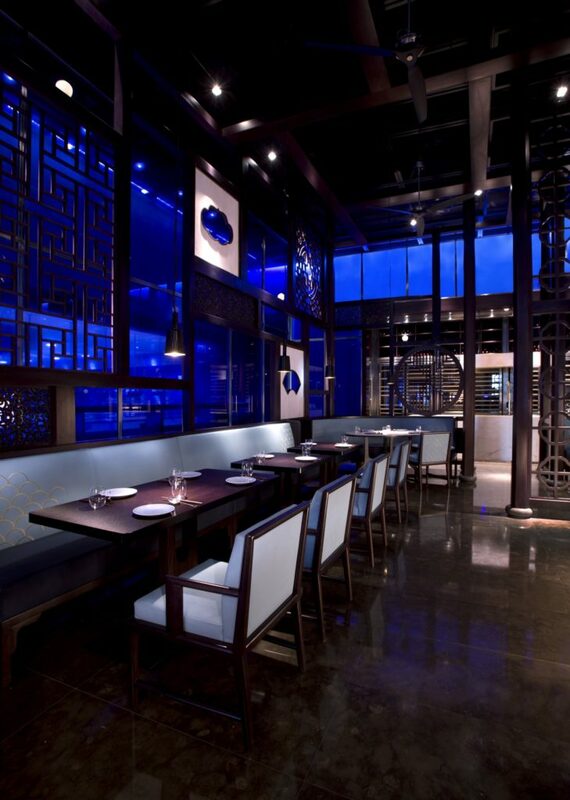 Signature elements such as the use of blue glass, the ‘caged’ dining area, the contemporary European interpretation of Orientalism in the design of the furniture, fittings and equipment, and the permeating scent of Bindi candles point to the Hakkasan legacy. Upon entering Hakkasan Abu Dhabi, visitors are greeted by an entrance desk made of stainless steel, mirror polished consoles and a marble top. This visual delight is punctuated by a hanging rectangular white silk pendant. The dining area’s cocoon-like atmosphere is generated by a surrounding woodwork structure infused with the restaurant’s signature blue glass and backlit stainless steel frames. The woodwork, primarily made of American red oak, gives patrons their first feel of Chinese design, which comes in the form of traditional patterns – visions of Chinese forms recreated in marble and wood, handcrafted and moulded Chinese pottery, and furniture in fish-skin embroidery. “All wood used in this project were stained a very dark ‘Wengue’ tone, with none of the original colour or variation in colour visible. 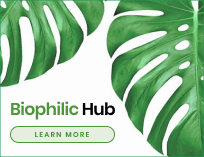 Some features of American Red Oak that we took great advantage of were the excellent depth of grain that occurs naturally without sacrificing structural integrity and its easy adaptability in carvings and structural elements,” added Veninga. The kitchen can be seen through the blue glass surrounding the dining area. This concept allows activity in the kitchen to be part of the whole dining experience, with diners treated to a live show on how their food is prepared. A long blue-toned glass rectangular bar with a retro-lit top accompanied with a back bar with blue, retro-lit acrylic shelves also forms part of the dining space. Hanging overhead are custom-made conical steel pendant lights while surrounding walls are fitted with ripple lighting to create an atmospheric night-time effect. 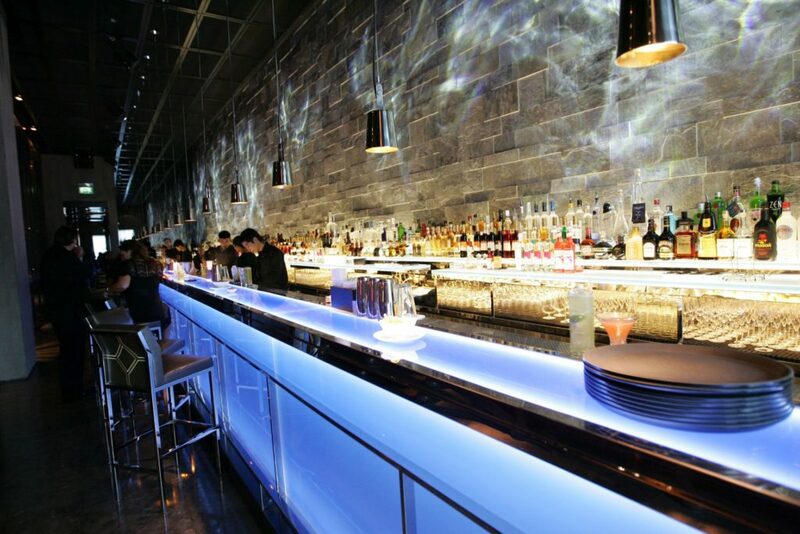 Hakkasan Abu Dhabi also boasts of a Ling Ling Lounge and Bar, which plays on architectural space with its American red oak -accented seats separated by white marble elements and heightened with red leather and dark blue pillows. In addition, Chinese red pendants hang on the ceiling like traditional Asian lanterns. The four private dining rooms are ably separated by vertical pinewood shutters, with the walls of each room adorned with hand-carved panels of grey-tinted American red oak depicting Chinese scenery. Another part of the restaurant that makes full use of the aesthetic beauty of American red oak are the toilets, which seek to capture an endearing sense of calm and a spa-like feel. Inside, white marble is set against dark wood and steel-framed mirrors and sinks are accented with a touch of teak. Asian-fragranced soap is further evidence of the high level of attention to detail inherent in this interior. 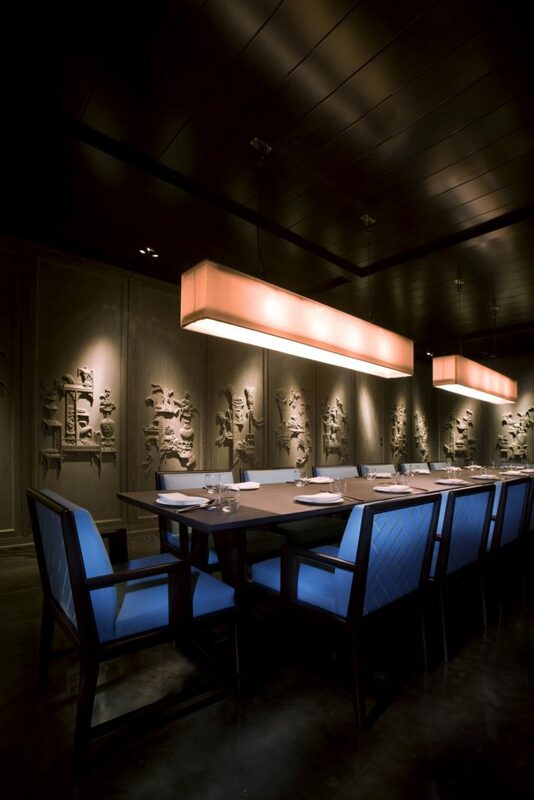 A key challenge faced by the design team was the restaurant’s interior lighting. The designers wanted a lighting concept that highlighted the patterns coming from the claustra and created contrast to the dark wood and other elements. The solution was to create a filter that diffused the UAE’s extraordinary sunlight. The wood color was highlighted by using lighter-toned leather while the windows were covered with dense Chinese woodwork that acted as a filter. The mood-enhancing set-up is made more sophisticated by strategic seating dimensions and spacing between tables and the infusion of local design elements. The end-result is a venue that successfully captures the essence of the original London restaurant while being anchored on its Middle East setting. 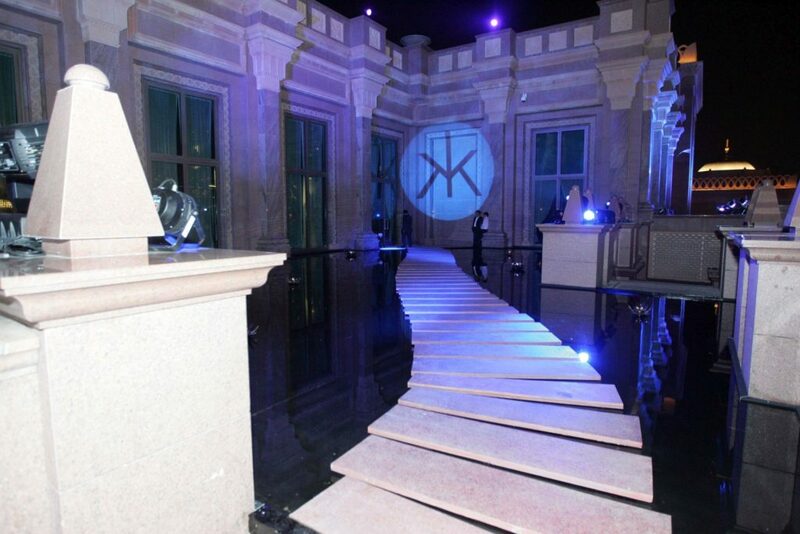 “We are very proud of our work with Hakkasan Abu Dhabi as it elicits both excitement and intrigue. What creates the identity of this space is the way that your eye can move, play everywhere and never rest. Each visit feels like the first time because each seat has a totally different view. We are particularly pleased with the ease of use of American red oak, which gave the interior contractor the opportunity of rendering the design and desired ‘Chinois’ feel to a successful reality. The timber depicts strength, shape and colour, while not being too susceptible to damage from everyday use. The wood being seen all over the place is synonymous to constantly greeting visitors with a warm ‘Welcome to Hakkasan’” concluded Veninga.